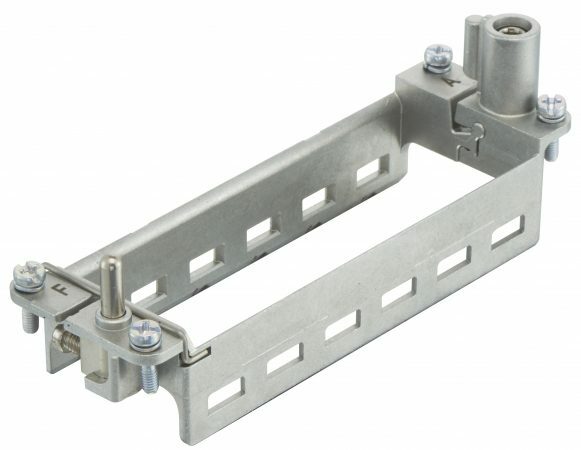 HARTING's hinged frame plus for Han-Modular connectors features an additional stainless steel spring that holds the frame in the open position during assembly. HARTING is adding a new spring-loaded frame to the Han-Modular building block system. The Han-Modular lineup now includes over 100 different modules for power, data and signal that can be combined virtually without limitation. The new “hinged frame plus” for Han-Modular connectors features an additional stainless steel spring that holds the frame in the open position during assembly so modules can be easily fitted into their proper position for faster assembly, and time and labour savings. All module positions (A to F) are evident at a glance, while an additional marking (a black triangle) indicates the orientation for proper insertion of modules into the frame. The frame windows have been optimized so that the modules are automatically centered as the frame is closed. Upon locking, there is a clearly audible “click” and the spring holds the frame securely together – dispensing with the locking tab used in the past. Since the general design of the previous hinged frame is maintained in “hinged frame plus”, the new design is fully compatible with all Han-Modular connectors.